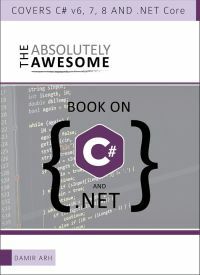 Since this week, The Absolutely Awesome Book on C# and .NET is finally available for order. Those who pre-ordered it, already received the first chapters in early access form in mid-December, and more of them as they were being finalized. But now, the book is available to everyone in its final form: in all eBook formats and with the accompanying source code. I started planning the book in late 2017 and have been writing it for most of 2018. Although I already had all the drafts written by November when the book was publicly announced and made available pre-order, I've been even more busy in the last two months than I was before as all the chapters went through the final editing process. After all this time, it's great to see the results of my work available for everyone to enjoy. If you're at least a little interested in C# and .NET (either .NET Framework or .NET Core), you can learn more about the contents of the book from its dedicated web page. If you think that you'll enjoy reading it, you can order it from the publisher's page. With all the work I've put into it, nothing would make me happier than seeing it in the hands of as many readers as possible.